strongest metal garage kit building design. Our sturdiest building, the "A" model with its slightly slanted walls and roof pitch, is engineered to withstand the most severe weather conditions including hurricanes, snow storms an earthquakes. Its 4:12 pitched roof is specifically designed for major and ice snow areas in the northern United States and can be insulated to counter climates of severe cold and freezing temperatures. The "A" model steel arch building has a minimum yield of 55Ksi and is manufactured to ASTM international standards and ASCE building codes. It is available in widths from 20 feet to 40 feet with any length you need and comes in several gauges of steel. All our metal garage kit prices are so competitive that we most likely will beat any quotes you will find. • Your Metal Building Kings A Model arch building is coated with AZ55 Galvalume® - which is comprised of aluminum, silicone and zinc which is an effective coating to help prevent rust and comes with a limited 40 year rust-through perforation warranty and a 40 year warranty against peeling paint, flaking an loss of adhesion. Choose from several accessories such as three types of metal building insulation, metal garage kit ventilation, or overhead doors of walk through doors and skylights. The pre-engineered metal building system in our metal garages make the construction process go smoothly without the need for heavy equipment, experienced contractors or special tools because the steel arches are easily bolted together along with the steel end walls. • Our state of art "Made In The USA" manufacturing provides you with prefab metal garages that are easy to assemble without the need for special tools and with a trussless roof clear span building design it gives you a 100% usable interiors. 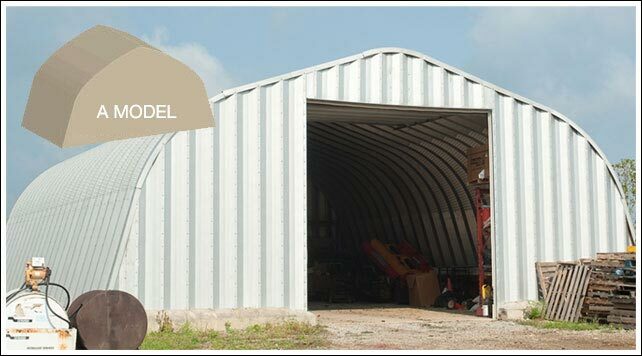 When you are ready and have chosen the right metal garage model for your steel building you can begin customizing your garage and pricing out different scenarios depending on what accessories or features you need installed into your building like doors, lighting, insulation and ventilation. Go to our online design and pricing system to calculate what the price will be for the building you envision ordering. Once you have received the different prices for your metal garage and have decided on your custom designed building you can place your order by phone at (412) 523-4797 and make your payments on our secure check out page with your invoice number and customer information. Communication isn’t over yet! We stay in contact with you through the entire process from manufacturing to delivery and construction. We want to make sure your project goes smoothly from start to finish so you will refer your friends and associates to us.